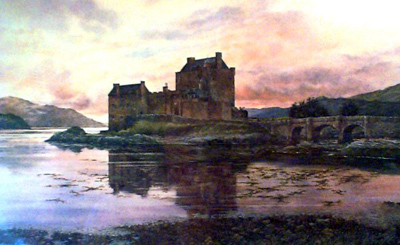 Much of the history of the castle has been preserved within its solid walls and immortalised in the ballads and stories handed down from generation to generation.The beginnings of Eilean Donan Castle reach back into the early mists of time. Evidence of a pictish fort was found in vitrified rock uncovered during excavations-some of which has been kept for visitors to see. At the beginning of the seventh century St Donan (d.618) lived on the island as a religious hermit: the name "Eilean Donan" means "Island of Donan". This was the period when Christianity was first introduced to the Western Isles.The first fortified stronghold was established in the reign of Alexander II (1214-1250). In 1263 Alexander III gave the castle to Colin Fitzgerald, son of the Earl of Desmond and Kildare (later to become MacKenzies) as a reward for services in the Battle of Largs. The famous battle culminated in the defeat of the Norwegian King, Haco. Following his death shortly after, his successor, Magnus, ceded all the Western Isles to Scotland.